This marker is located at 879 Foothill Roard, Gardnerville, Douglas County, Nevada. There are 17 other historical markers in Douglas County. 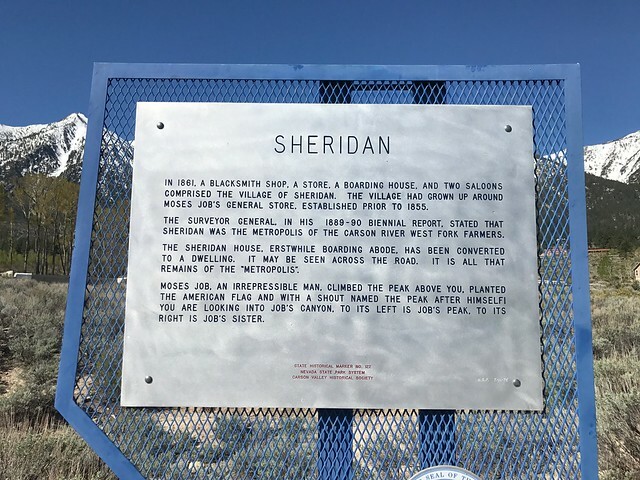 The GPS coordinates for this location are 38° 54' 04.6" N 119° 49' 33.2" W.
In 1861, a blacksmith shop, a store, a boarding house, and two saloons comprised the village of Sheridan. The village had grown up around Moses Job's General Store prior to 1855. 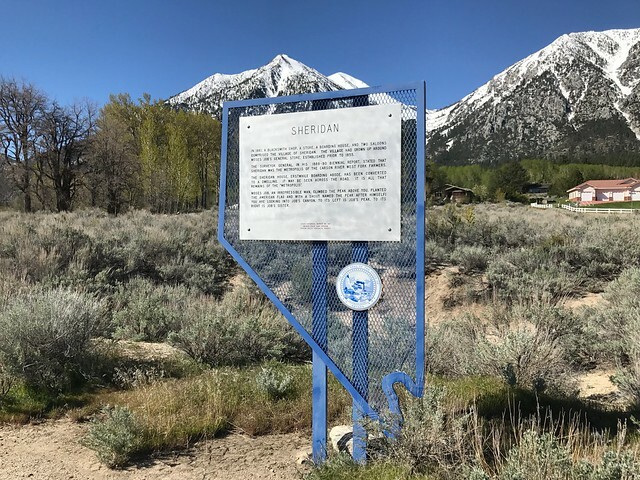 The surveyor general, in his 1889-90 biennial report, stated that Sheridan was the metropolis of the Carson River West Fork farmers. The Sheridan House, erstwhile boarding adobe, has been converted to a dwelling. It may be seen across the road. It is all that remains of the "metropolis." Moses Job, an irrepressible man, climbed the peak above you, planted the American flag and with a shout named the peak after himself! You are looking into Job's Canyon, to its left is Job's Peak, to its right is Job's Sister.